Leticia Eirín García’s latest book has just been published by Edicións Laiovento as part of its ‘Ensaio’ series. This month sees the release by Edicións Laiovento of a new book by the University of A Coruña lecturer and ILLA group researcher, Leticia Eirín García, entitled A visión do amor no cancioneiro de Don Denis. Estudo e edición de 33 cantigas de amor. 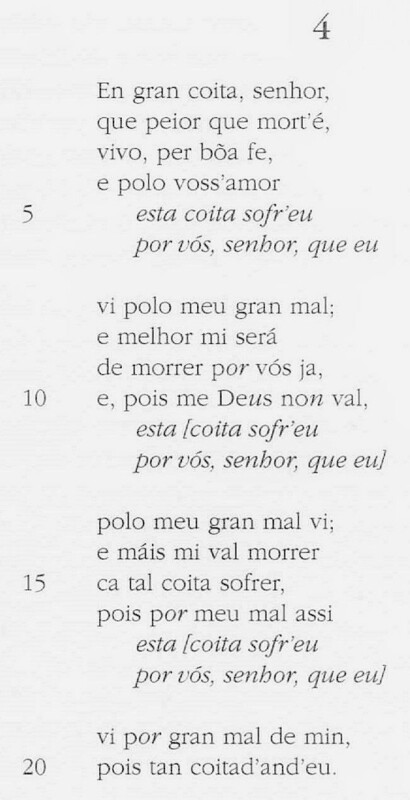 The book examines references to a female vision in thirty-three love songs (or cantigas) by Denis of Portugal (1260-1325), the Portuguese troubadour poet and king. Eirín’s analysis focuses on the idea of troubadour love and the classical motif of a woman who appears to the poet in a vision, exploring the feeling of love described by the male poetic voice in direct response to that vision. The work also includes a critical analysis of the rhetorical and literary aspects of each cantiga, a detailed account of the critical editing process, and a description of the neo-Lachmannian approach used and other important advances in textual analysis studies. The thirty-three love cantigas in the Dom Denis songbook make the collection the largest corpus of troubadour song poems by a single author. Just as remarkable as the number of songs, however, is the quality of the compositions, in which the poet unites traditional and innovative elements, and establishes a dialogue with other schools of troubadour poetry, most notably the Provençal. Eirín’s new book highlights the unique character of Dom Denis’s work within the more formally homogeneous genre of medieval Galician-Portuguese poetry, his role as the last great king to form part of the Galician-Portuguese school of troubadour poetry, and the importance of that role in relation to the recognition, revival and re-evaluation of the cultural and literary heritage of Galicia.